New Scooter "Nozza" Manufactured in Vietnam for the Vietnamese Market | Yamaha Motor Co., Ltd.
Yamaha Motor Co., Ltd. has set four medium-term growth strategy goals in its current medium-term management plan announced February 12, 2010 based on the company's long-term vision "Frontier 2020." Focused in the areas of personal mobility and engines, these goals include (1) introducing affordably-priced motorcycles in emerging markets, (2) simultaneously increasing the competitiveness, appeal and profitability of motorcycles in the ASEAN region, (3) developing next-generation environmentally friendly engines and (4) developing and marketing "Smart Power" technologies and products. A central technology for realizing the goal of "increasing the competitiveness, appeal and profitability of motorcycles in the ASEAN region" is Yamaha's exclusive fuel injection system YMJET-FI*. As it continues to develop this streamlined, highly efficient system, Yamaha Motor aims to boost product competitiveness by (1) enhancing the product appeal by increasing the ratio of models featuring the fuel injection system and (2) reducing the cost of fuel injections systems and increasing profitability through the benefits of larger scale production. New scooter "Nozza" manufactured locally at the Yamaha Motor Vietnam Co., Ltd. factory for the Vietnamese market is a product of the medium-term growth strategy described above and mounts the YMJET-FI system on a 115cc air-cooled 4-stroke engine to provide good fuel economy. 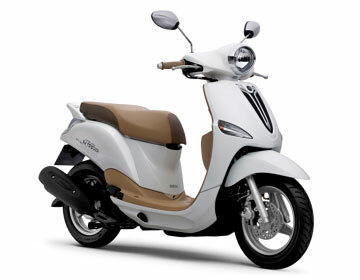 This model will be released in Vietnam in the autumn of 2011. Positioned primarily to meet the needs of female customers of the younger generation, the Nozza is designed and engineered to be "Stylish, Handy and Comfortable." This is the first automatic transmission (AT) scooter with smaller-sized 12-inch wheels to be designed and developed specifically for the Vietnamese market. The Vietnamese motorcycle market currently has an annual demand of approximately three million units (Yamaha Motor survey, 2010 results), of which the demand for AT models is about one million. Supported by continued economic growth, demand is expected to expand further in 2011 and 2012, particularly in the urban centers with a concentration in the AT category. The new Nozza has been planned and developed to target particularly the female customers that predominate in the AT category. *YMJET-FI (Yamaha Mixture Jet-Fuel Injection): A fuel injection system employing an auxiliary air intake passage besides the main passage to provide an "air assist" for more efficient mixing of the air and fuel that helps improve fuel economy in the practical use range.